When mentioning the great rivalries of motorcycle drag racing one may think; Kawasaki vs. Suzuki, Harley vs. import, Dave Schultz vs. John Myers; the list goes on. Perhaps the most hotly-debated and reoccurring rivalry over the years has been nitrous vs. turbo. There are numerous tales of this impassioned and sometimes contentious debate in Pro Street, Pro Mod, Outlaw Pro Street (check out this Cycledrag.com article from 2006 where some of the same players of today debate the same issue) and others. Rob Muzzy and Ryan Schnitz were once thrown out of Pro Mod for making one quick pass on a pioneering ZX-12 turbo in 2002. There was the Bill Hahn Jr. and Scott Crippen tale (More to come on that soon). The turbo Pro Mod entry of Ryan Schnitz and Rob Muzzy that was banned after just one race in 2002. It seems it has been impossible for turbo and nitrous combinations to live in harmony. Another chapter in this war is about to be written. 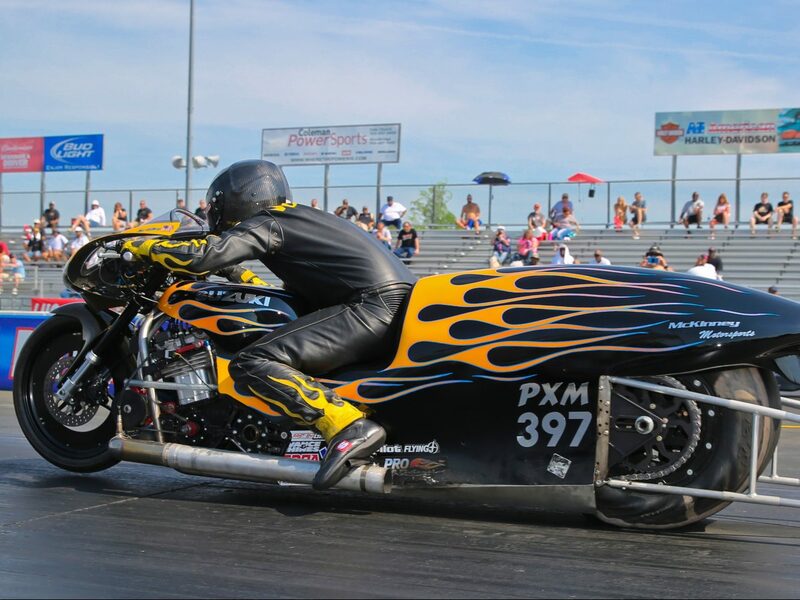 At the end of last season PDRA President Bob Harris announced the introduction of turbos into the traditional nitrous-oxide category, Pro Extreme Motorcycle. You can read about the rule change and the reaction from competitors here. The move was in an effort to boost bike count for a category that has experienced a drop in participation over the years. Pro Street turbo racer Ehren Litten of Williford Racing took advantage of the new rules and built a state-of-the-art turbo Hayabusa that found immediate success. Litten has already run in the three-second zone and won an event. The rivalry took another turn when longtime nitrous loyalist Dan Wagner of DTM put together a dream team of motorcycle drag racing specialists for a new turbo build for Virginia-based competitor Kevin Clark. You can read about the intriguing build here. In its PDRA debut, Oct. 5th at the Fall Nationals from Darlington Dragway, the bike smashed the class record by six hundredths with a 3.91. Read about it here. Although Schweigert did not win the event due to a red light start, the machine’s potential has drew the ire of some PDRA nitrous racers and forced Harris into an unenviable position. Nitrous team owner Scott McKinney has supported the class over the years from a participation and financial standpoint. His son Eric McKinney is a three-time PDRA champion, and has a staggering 55 Pro Mod / Pro Extreme event wins and six championship titles to his credit. Scott McKinney alonside his son Eric. McKinney says his team, which includes the multi-time champion and first man to put a Pro Mod in the three-second-zone Ashley Owens, will not enter anymore PDRA races as long as the turbos are legal in PXM. “I put a lot in and I’m not going to support it anymore,” said McKinney, who says he’s contributed thousands of dollars of purse money to the PDRA over the years. McKinney said back when the ADRL, predecessor to the PDRA, began the onus was on the racers to bring their own purses and it wasn’t uncommon for him to contribute $1,700 or more to help meet payout. Eric McKinney, Scott McKinney, Steve Drake, Ashley Owens and team celebrating an ADRL championship. McKinney was paying close attention to the 3.91 and 3.92 Schweigert ran in the motorcycle’s debut. McKinney says the rule changes are not doing what they were intended to do. Instead of growing the class, McKinney said it’s killing it. McKinney’s suggestion is to break the class up into two separate categories – Pro Boost and Pro Nitrous. McKinney says adding weight to the turbos is not a viable solution. McKinney’s team entered two PDRA events this season and won them both. McKinney said Wagner called him after the Fall Nationals to see what it would take to get his team back. “Park the turbo,” McKinney said. Wagner, admittedly, fully understands the new bike could and will likely force rule changes – amendments that would help his nitrous customers. The new turbo bike’s primary goal is to run in the fives in the quarter-mile. The PXM category may have just been a stop along the way. McKinney admits the class has fallen from grace from the days when 25 Pro Mods would show up and try to qualify. It’s something McKinney blames on the collapse of the economy a decade ago and the dominance of his own team. McKinney isn’t even ruling out the idea of building a turbo himself but still thinks participation in the category will decline. “Now why would a guy like T.T. Jones drive all that way to a race from Alabama knowing he just ran a career best and is still about 15 hundredths slow,” McKinney said. T.T. Jones team member Angelia Garner-Jones was outspoken on Facebook when asked about the statement Wagner’s team was making with the turbo. “Screw the statement,” Garner-Jones wrote. Garner-Jones then expressed how her team is looking at other places to race next season. Nitrous team owner, Ed Grothus of Grothus Dragbikes, who watched his son Brunson Grothus win the PDRA Fall Nationals and record his first three-second run expressed concern over class parity. Brunson has climbed to within two rounds of point leader Ronnie Smith and the team says it plans to be at the upcoming PDRA World Finals in Richmond, Va., Oct 18-21. Grothus says the performance of Schweigert last weekend has already impacted his team’s chances for a title. Like McKinney, Grothus feels the move designed to help the class is hurting it now. Grothus is also unsure how to level the playing field. Like McKinney, he does not like the idea of adding weight. He points to Travis Davis running a 1.31 back split on a turbo with a smaller 1327 c.c. motor as evidence that undersized engines will not cure the problem. Grothus concluded by saying that although the rules need tweaking he commends Harris and PDRA owner Tommy Franklin for sticking with the motorcycle class and trying to help improve it. Certainly Harris and Franklin are not to blame for trying to help a class. It’s the age old nitrous – turbo rivalry that has caused decades of dissension in dragbike racing that is to blame once again. At the end of the day anything that gets people talking, evokes strong emotion and passion is good for the sport of motorcycle drag racing. Apathy is the worst killer of them all. And clearly by the opinions expressed in the past seven days there is much interest in PDRA Pro Extreme and dragbike racing in general. Mr. Harris finds himself in a tough spot balancing class parity while trying to maximize the amount of entries PDRA can draw. Like the current situation in NHRA Pro Stock Motorcycle the objective is to have the different brands or combos all running in the same elapsed-time range. It’s easier said than done. Is there a way to maintain parity between turbos and nitrous bikes? Is it better to break up the classes? What would you do if you were president of the PDRA? Feel free to leave your take.